Japanese Episode AG 189: "The Pokemon Center is Very Busy!" American Episode 459: "Pinch Healing!" Satoshi has resumed his training for his battle against the final Frontier Brain. While the young challenger trains, the Joi inside the Fennel Valley Pokemon Center falls ill! Joi tries to shrug it off and announces her desire to return to work, but Orchid-Hakase and the others insist that she leave everything to them. Later, an accident caused by a falling Marumine causes a bus full of pokemon to crash! The pokemon inside are injured, so Satoshi and the others rush to the scene to take them back to the Center. One of the pokemon, Tatsubay, runs off, so Satoshi and the person who was looking after the pokemon run off to retrieve it. Eventually, the wannabe flyer falls into a river full of Kibahna and requires Satoshi to rescue it. After the pokemon is retrieved, it is rushed back to the Pokemon Center so its fever can be tended to. While Tatsubay recovers, the Rocket-Dan appear and try to steal the injured pokemon! Luckily, the time spent helping out at the Center allowed Haruka and Masato to become familiar enough with the pokemon to command them in battle. After the Rocket-Dan are sent blasting off from Pikachu's Volt Tackle, Takeshi announces that Tatsubay is all better. Later, Soutarou, Jindai's referee, announces that the Pyramid King has gotten the pokemon he set out to retrieve and is on his way back now. With the big battle looming ever closer, Satoshi trains harder than ever so he can complete his Battle Frontier challenge. For the final filler episode of the series, this episode isn't terrible. It's not great either since it's a rehash of several other fillers, but it manages to be entertaining. There were a few Satoshi WTF moments (acting like he never knew about the whole Tatsubay flying thing, throwing a friggin' tree to save the pokemon), and the fact that Enishida is apparently a bus mechanic was unexpected, but other than that it wasn't all that memorable. The guy known as Matt in the dub is known as Mike in the Japanese version. Replacing one English name with another English name? If that isn't a facepalm moment, I don't know what is. Also, there's like seven pieces of background music kept in the dub, so that's better than usual. One piece, the music that plays when Bagon's being wheeled into the Pokémon Center, isn't usually heard in the dub (in fact, I can't think of any other dub episode where it's been used in), so hearing it now is pretty refreshing. 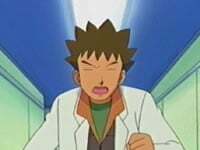 Oak: "The Pokémon Center has a car and we could ask Scott to come over and drive us." Ash: "That's a good idea, professor. I'll do it." In the Japanese version, Orchid-Hakase merely states that the Pokemon Center may have a car they can use. After that, Satoshi says he'll call Enishida to come over. The "come over and drive us" part is what stood out to me since it insinuates that Professor Oak can't drive. While it's true that we've never seen the man behind the wheel of a car before, I'm pretty sure he's capable of operating a car if necessary. Later, I could have sworn that Max calls Makuhita "Makukita" when he's giving the pokemon food. Finally, Soutarou tells Enishida, at the end of the episode, that Jindai has succeeded in capturing the ice pokemon he left to get. The dub version pretty much says the same thing. But, just like it did in "Overjoyed!," it omits any mention that the pokemon caught was an ice pokemon. Why are you dancing around this, PUSA? Are you trying to make the identity of Brandon's new pokemon harder to figure out? Because I'm pretty sure most kids can put two and two together. The TO BE CONTINUED... screen is made three seconds longer in the dub.